“Adam,” a poor 19-year-old Indonesian, found a job driving trucks for a palm oil plantation that paid $6 a day. The foreman picked him up for a three-week, two-thousand mile journey to the worksite in Borneo. Along the way the terms of employment changed: Adam wouldn’t be paid for two years, and in the meantime he would have to borrow money from the employer for his food and housing. Workers who ran away from the company were dragged back and beaten. Adam had become a slave laborer, as Businessweek’s Benjamin Skinner reports. Palm oil producers in Indonesia and Malaysia rely on forced and child labor, but poverty-stricken Asians aren’t their only victims. They also clear tropical rainforests to to plant their oil palm trees, obliterating the homes of endangered species like orangutans, pygmy elephants and Sumatran tigers. 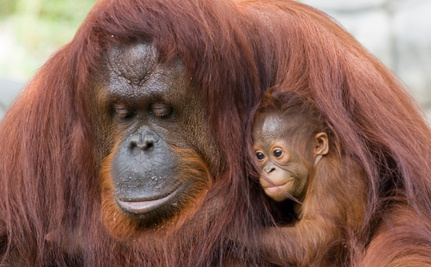 Only 60,000 or fewer orangutans are left in the wild. Orangutan Foundation International says they will go extinct without “drastic intervention.” They aren’t able to bounce back quickly from mass deaths: females don’t reach sexual maturity until they are 10 or 15 years old. They usually give birth to only one baby at a time, whom they nurse for about 3.5 years before they become pregnant again. More than 50% of orangutans now live “outside of protected areas, in forests under management by timber, palm oil and mining companies,” WWF reports. Not all palm oil comes from environmental destruction and worker exploitation, but food manufacturers have no way to distinguish humane and sustainable palm oil from the kind that is destroying human and animal lives. Cargill and other companies that supply the manufacturers combine palm oil from all sources, so even if manufacturers want to favor conscientious producers, they can’t. The Rainforest Action Network (RAN) has launched a campaign called “The Last Stand of the Orangutan” to address the problem by targeting the biggest manufacturers of palm-oil-laced snacks. The goal is for those businesses to pressure suppliers to separate out sustainable palm oil so they can buy it exclusively. A boycott won’t work. For one thing, the behemoth corporations that make foods with palm oil make such an overwhelming number of the items in grocery stores, including not just food but household and personal care products as well, that it would be impractical to steer clear of them. For another, shoppers can’t tell from reading the ingredients whether a product contains palm oil. It is disguised under different names, including vegetable oil, glyceryl stearate, and palmityl alcohol. For a more complete list of palm oil’s aliases, visit Say No to Palm Oil. For more specific actions you can take and tools to help, visit Alternet. Thank you for this. I was quite shocked to see Nestle on this list, and Cadbury on another list. I'll check all the ingredients from now on and if they mention Palm Oil then I'll refuse to buy it. Although I'm sure some sneaky greedy companies won't even mention Palm Oil even though it contains it. Shame on them for doing this and for the devastation it causes. This kind of thing has to stop,slavery went out with the ark. Thank you for the post. I have been aware about the palm oil issue for some time now and have been taking steps to actively avoid it. It is so ubiquitous! I don't want to contribute to the destruction of magnificent forests and the habitats of wildlife such as orangutans and elephants! They are such beauties and need protection! i was in Sumatra in the late '80's and they were wiping out the Forest to plant palm oil plantations then, 25 years ago. i can't even imagine what it looks like now. i went to the Orangutan Preserve and it was one of the most Amazing Experiences ever. my heart is just so sad reading this and i will do all i can to help. if we can all take one small step in this direction, then it becomes a BIG step....the power of the many.